Ringing - This skilled practice has been carried out on the Gronant Little Terns for the last 35 years. All ringing is done under licence from the BTO and carried out by experienced people. The photo above shows a chick having a metal ringed applied so this individual can be recognised in the future if it is recaptured or found dead. Biometric information is recorded such as wing length, bill length and weight. A study of chick growth rates back in the 90's showed that the chicks can get to full adult weight just 10 days after hatching, a particularly fast rate for a bird this size, indicating the need to grow up quickly on an open beach with threats all around. Ringing has also given us confirmation that the Gronant Little Terns are migrating to West Africa for the winter with recoveries from Guinea Bissau amongst other countries. This is a journey of 3500 miles each way. Colour-rings - A contemporary method of attaching colour-rings (funded by the EU Life+ project) has allowed individual birds to be monitored without the need of re-catching them to read a ring. The colour-rings have a unique three-letter code which can be read at a distance with a field-scope and the bird is not disturbed. It can take great patience to read the codes but the information gained is invaluable. For example it used to be theorised that Little Terns remained in Africa for their first and maybe even second summer after being born. We now know this is not the case, with a small proportion returning to Gronant in their first summer and even more in their second summer. The map below shows another interesting outcome of colour-ringing, that of knowing where birds are moving from and to around the UK (from the 2017 season). Map showing where colour-ringed birds originated from that were seen during 2017. Go-pro camera monitoring - A new method that was trialed in 2017 whereby a camera is placed near a nest for a couple of hours and set to take a picture every second. A lot of data is produced but of most interest is whether the bird is carrying a colour-ring. The trial showed that if a bird has a colour-ring we should be able to read the code. It is planned to expand this to the whole colony in 2018. The photo below is an example from the 2018 season showing a bird with ring-code 'ACC'. This is a bird that was ringed on the Isle of Man. The stills could also be utilised in the future for a range of behavioral studies including chick feeding investigation, incubation, energy budgets, food provisioning, prey species etc. ACC from the Isle of Man seen on a nest at Gronant in 2018. This shot shows the potential of the go-pro cameras. 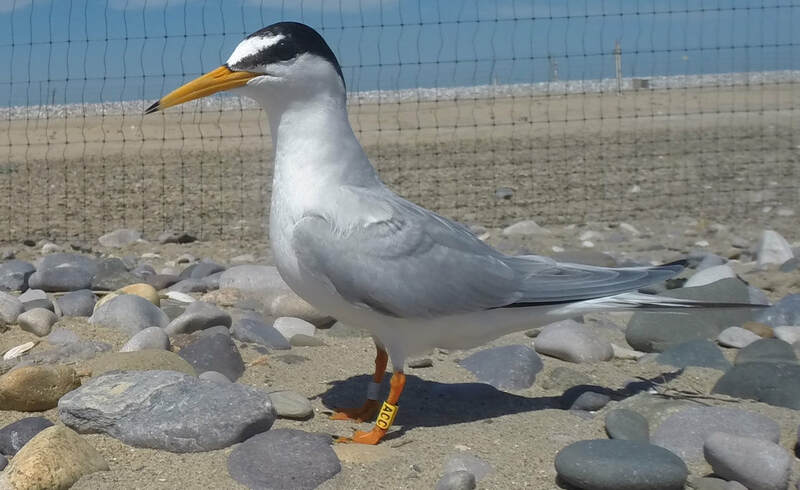 Student research - A collaboration between Denbighshire Countryside Services and Bangor University, formed in 2018, will see up to three students carry out their dissertations on the Little Tern colony at Gronant. There are many aspects of Little Tern ecology and conservation biology which have not been investigated previously at Gronant or even in the UK as a whole. We hope this partnership will allow the students to achieve successful outcomes and the insights gained should be of great interest to the future conservation of the species in Wales and beyond.